I grew up in the Mojave desert. The Mojave Yucca (Yucca Schidigera) is a member of the Liliaceae, the Lily family. They grow in the Southwestern USA, Northern Baha CA/Mexico. This particular one was photographed on my way to Scottsale Arizonia. When I was a child growing up in SanBernardino Ca, they grew out towards Cajon Pass. When they were in bloom we would take my grandmother to see them She called them "The Lords Candlesticks". 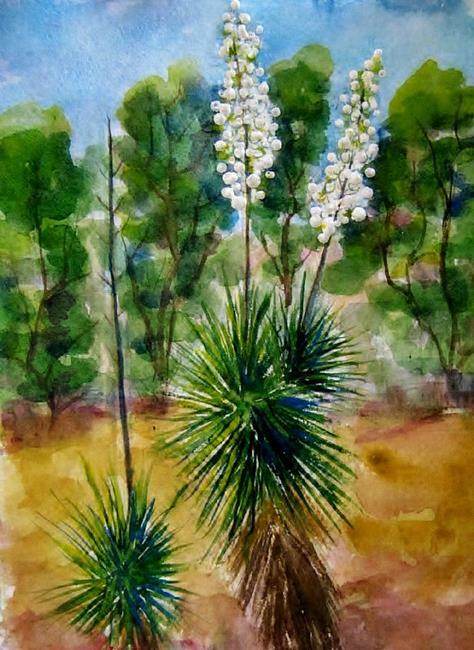 Yuccas and Joshua Trees were one of my first subjects when I started painting in 1977. This is painted with watercolor on Arches 140# paper.